Chairman Mao Tse-tung holds a nefarious place in history. His reign holds the distinction of creating the largest death toll attributed to any government administration in history. He ruled China during a particularly turbulent social time and played a pivotal role in the Chinese Communist Revolution. Though dark clouds obscure his legacy, a few bright points shine through. Those that laude him credit Mao for modernizing China and elevating China’s role in the international pecking order. His policies have been credited with improving education and health care, increasing the status of women, providing universal housing and raising life expectancy. Controversial though he is, Mao is regarded as one of the most important individuals in modern world history. Learn from history or be doomed to repeat it. This sage advice has served well throughout time and is particularly applicable to a figure as polarized as Mao. As a revolutionary leader, Mao recognized the strength of youth in generating cultural change. He inspired young people from middle school through university to adopt his ideology and encouraged them to use their strength to forcibly advance his ideas. The majority of these inspired youth were between the ages of 12 and 17. Collectively they formed a militant group called the Red Guard. This tactic was extremely effective and understandably so. Young adults have a predisposition for rebellion that is believed to be an innate mechanism to facilitate the separation of offspring from their parents. Combine this defiant spirit with the energy reserves of youthful bodies and the idealist nature of young optimistic minds and it is easy to see why this age group is a powder keg capable of powerful action. That’s a neat history lesson, now what does this have to do with straw bale homes? I’m getting there, but first a little biology. Noeteny is the retention of juvenile traits in adult animals, or more simply, the retention of youth. Humans are very adept at neoteny. Neoteny in fact is the central survival strategy of our species. We have extended gestation periods. We rear our young longer than most other animals. Our brains take decades to fully develop. All of this investment in development yields human adults with large, intelligent, complex brains and an incredible capacity for manipulating our environment. Our social structures are shifting to accommodate increased neoteny as the average lifespan increases. No longer is it the norm to graduate high school and enter the “adult world.” Today, it is considered standard to graduate from a four year university before beginning a career. 22 is the new 18. This sounds great in theory. Four more years to guzzle beer and make bad choices before the baton of responsibility is handed over. But remember the powder keg. Mao recognized its strength and showed us that it can turn violent. Structural economic shifts have lit a fuse under the powder keg of today and it is our responsibility to direct the blast in a positive direction. 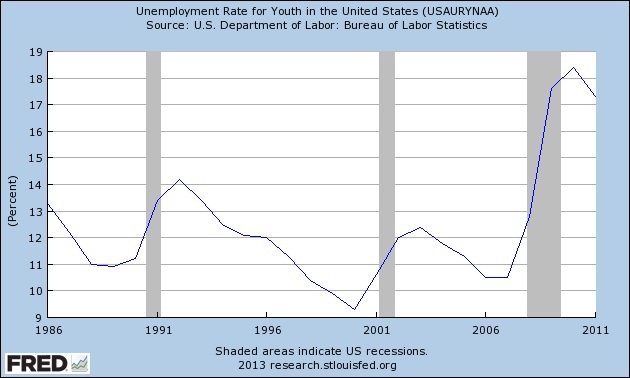 Since the Great Recession of 2009 the unemployment rate for youth has skyrocketed. Many 22 year olds directly out of college face bleak employment prospects. Concurrently, many low income families have been priced out of the housing market and the denied the opportunity to generate lasting equity. This creates a potentially volatile scenario, or a tremendous opportunity. Unencumbered by age and dogma, young idle hands are seeking opportunities to work for positive change. Many young adults lament the fact that our workforce development systems have all but eliminated traditional trade apprentice opportunities. Enter Community Rebuilds, a program that teaches practical skills, overcomes barriers to affordable home ownership and encourages forward thinking building practices. Is Community Rebuilds a panacea? Of course not. Is it cheaper than unemployment checks? Does it provide a model for addressing some of the pressing problems of our time? Is it a better alternative than revolution? Absolutely. Mao, eat your heart out.